NAKED CASE™, a Canadian product design firm, has officially launched a Kickstarter campaign for "The World's First iPhone 7 Jet Black Scratch-Resistant & Naked Case™". 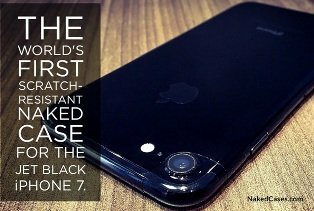 Toronto, Ontario, Canada - NAKED CASE™, a Canadian product design firm, has officially launched a Kickstarter campaign for "The World's First iPhone 7 Jet Black Scratch-Resistant & Naked Case™". The Kickstarter campaign aims to garner worldwide support and financial backing to mass produce the case for consumers. "The high-gloss finish of the jet black iPhone 7… may show fine micro-abrasions with use… use one of the many cases available to protect your iPhone." Despite Apple’s warning, many consumers refuse to cover their phones with an ugly or bulky case, yet they want to keep their new iPhone in pristine condition. Enter Naked Cases, a revolutionary new case created by two Toronto based inventors, JP Richards and Doug Assaly. Naked Case is custom-cut from "EXPEL ULTIMATE Paint Protection Film" the same scratch-protection film that has recently become popular with high-end sports cars like Ferraris, Lamborghinis, and Teslas. “Your Jet Black iPhone 7 is probably one of your most important purchases. PROTECT IT by keeping it looking new with a Naked Case.” says, JP Richards, Co-Founder of Naked Cases. Protection with scratch-resistance, stain-defense (e.g. markers, coffee, etc), and non-yellowing tech. The world’s thinnest case with an ultra-thin (at only 0.2 mm) and ultra-clear cover. Most impressively, self-healing technology, which makes most case scratches disappear within seconds. The result for the consumer is the peace of mind of having a scratch-proof iPhone, and the joy of keeping their expensive new Jet Black iPhone 7 looking brand new. Kickstarter is a funding platform for creative projects. Everything from films, games, and music to art, design, and technology. ‘Backers’ who support a project on Kickstarter get an inside look at the creative process, and help that project come to life. All ‘Backers’ of the Naked Case Kickstarter campaign who pledge $30 CAD or more will receive a custom cut Naked Case™ for the Jet Black iPhone 7 (MSRP $40).